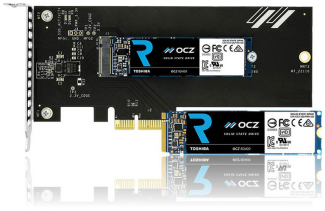 CDRLabs has taken an in depth look Toshiba's new OCZ RD400 SSD. Designed with enthusiasts and hard-core gamers in mind, the RD400 is the company's first consumer-ready Non-Volatile Memory Express (NVMe) SSD. This NVMe 1.1 compliant, M.2 form factor drive is powered by Toshiba's TC58NCP070GSB controller and is available with up to 1TB of their 15nm MLC NAND flash. With its PCIe Gen3 x4 lane interface, the RD400 also shatters the traditional SATA bottleneck by delivering over four times the performance of SATA SSDs.